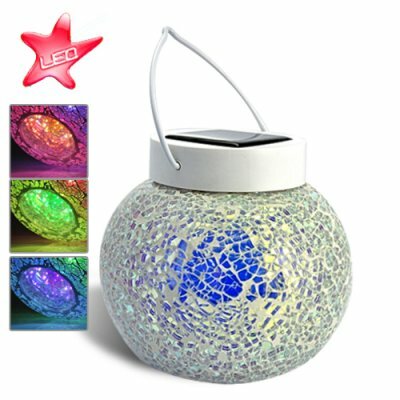 Successfully Added Colorful Mosaic - Glass Solar Lamp (Automatic Color Changing LED Gadget) to your Shopping Cart. Colorful Mosaic - Glass Solar Lamp (Automatic Color Changing LED Gadget) - Light up your place during night time with this glass-made and solar-powered mosaic lamp! If you are looking for a brilliant way to decorate your veranda or living room, then this solar gadget will definitely meet your expectations. Composed of fragments of glass, this Glass Solar Lamp forms a pretty mosaic design that reflects interesting shapes and objects around. It is also solid, light, discreet and small so you can place it wherever you want - it will blend into any decor! In other words it would make a pleasant gift for your friends, relatives, and even yourself! But the best part comes at night. After being fully charged by sunshine during day time the lamp lights up automatically at dusk to agreeably surprise your guests! Relax while enjoying the freshness of night or while watching the moon and stars in the bright sky. The charming atmosphere remains until dawn as the light lasts more than 8 hours! This Glass Solar Lamp brings a new aspect compared to other ones available on the market. Usually they are single color but this one is multicolor. Indeed 3 LEDs are located inside and each of them emits red, green and blue beams! The colors change automatically, mixing then randomly, which makes special effects projected on different surfaces and in different positions. Moreover if ecology is one of your concerns, the fact that this solar gadget is environment-friendly by only working with solar energy will please you. It also means no wiring is needed so it makes this jar safe and easily movable. What more? During winter time you can still use it even by dull weather. How? Simply put a candle inside to keep enjoying some mosaic effects! It will also protect the flame from wind. Don't wait to brighten up around your home or restaurant with this colorful lamp. Order several now at an unbeatable price and we will ship them out tomorrow! This is brought to you by the online leader in China wholesale gadgets - Chinavasion.